Learning how to draw a realistic mouth is one of the first skills you’ll need in your toolkit if you want to be a portrait or character concept artist. And, whether you decide to go detailed or just want to simplify things with a few simple strokes, this course from Francis Vallejo will give you the skills you need to capture a wide range of emotions in your artwork. Just like the eyes, the mouth is one of the most expressive features of the face. So, if you want your characters to look surprised, shocked, happy or sad, you’ll want to watch each of these fun videos to get a full understanding of how the mouth works. No more flat-looking expressions or lips that just don’t look quite right. Because after you’ve picked up these professional tips from Francis, you’ll be itching to get started on a portrait or character concept of your own with new-found confidence. First up, you’ll learn how the mouth is constructed. By seeing how it sits on a cylindrical plane, you’ll get a deeper understanding of how the lips move in relation to the rest of the face. And, that can only mean better drawings and paintings for you! Next, you’ll see how to simplify things and express just about every emotion with just a few simple strokes. Take a look at any of your favorite comic books, and you’ll see how some of the world’s most epic comic artists have managed to do this so successfully. Now it’s your turn! Once you know how to simplify what you’re drawing, it’s amazing how much easier it becomes to start playing around with these basic elements and adding a new depth to your paintings and drawings. That’s why Francis will also be showing you some failsafe formulas for capturing any expression and pushing things a little for added drama or humor. You’ll also get a guided tour of some of the most amazing drawing and paintings of mouths ever produced. Ever wanted to know the secrets behind Rembrandt’s uncanny ability to capture the personalities of his subjects? The answer often lies in those little details – you know, things like dimples and expression lines. By understanding how the movements of the mouth affect other parts of the face, you’ll have a whole new range of skills for learning how to draw a realistic mouth right at your fingertips. So, whether you’re just starting out or need to brush up on a few key skills, prepare to pick up your pencils and get going. It doesn’t matter whether you want to draw comics or produce super-realistic portraits – the skills you’ll pick up in this video course will give you a great place to start from. 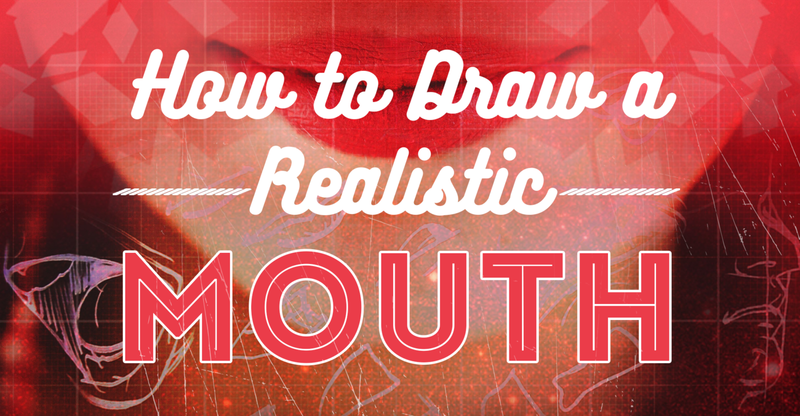 Before you know it, you’ll be learning how to draw a realistic mouth like some of the world’s best artists. And, once you’re done, you can share your work on our Community page or our Facebook community group and get feedback from fellow artists just like you. After watching this video course, we’re pretty sure you’ll have a smile on your face and a whole bunch of new skills at your disposal. You’ll see just how important the mouth is to a portrait or character, and how a few simple lines can say so much. You can cover a lot of ground in six lessons, and Francis has a great way of helping you memorize each new technique on how to draw a realistic mouth. And, because each lesson is so easy to watch, you’ll find that you’re learning more without even realizing it! Pretty epic, huh? Have fun, enjoy this course on how to draw a realistic mouth, and don’t forget to upload your work to our Community page afterwards – we’d love to see how much progress you’ve made with learning how to draw a mouth!